For teachers out there, helping children meet their learning goals and assisting them with their educational development is the primary goal. However, what many teachers don’t realize is just how important the environmental conditions of the classroom are. Investing in quality furniture and classroom storage solutions can really enhance children’s learning. Through acknowledging that time and effort has gone into constructing the classroom set up, children become increasingly motivated to learn and proud of the space they learn in. What’s more, quality furniture is highly important for children’s safety and security in the classroom. Having reliable furniture ensures a level of security for those little humans who lack spacial awareness and bump into things! From the way that books are stored in the corner to where the arts and crafts supplies are stacked, the furnishings can make an enormous difference. It is really important for children, especially in the early years, to know that their educational space is valued. The furniture used in this sense is like the foundation. From here, teachers build on this with colors, decorations, and images to create an exciting and enthusiastic learning area for children. There are many quality furniture products available for teachers to use in the classroom from Tierney Liquidators. These products are a wonderful investment to show students that their learning space matters and is a space worth investing in. Some of the products available from Tierney Liquidators includes the Jonti-Craft range. These are solid and sturdy furnishings that are perfect for the classroom space. A brief description is given below. Reading to children is an absolute fundamental key in early years education. Children respond best to reading stories when they have a visual to engage their attention. Big books work wonders for this. The big book display from Jonti-Craft allows teachers to have a solid space to set up a large book. There is also a handy ‘write-n-wipe’ space under the book to take notes on the whiteboard as you read. This is a great way to prompt children with questions and vocabulary words to remember. Developing aural skills and engaging students in listening can be problematic in the early years. Setting up space for children to have a listening station is a dilemma regularly faced by teachers. However, it is so useful for children to develop their aural comprehension to further enhance their vocabulary skills and conversational skills. The Jonti-Craft Audio Caddie is an ideally sized and convenient solution. Here you can stack two sets of headphones and some audio books for students. The size of the caddie fits perfectly on a desk so students it isn’t too bulky. This is a perfect way to set up a listening station in the classroom. Reading is so essential in early childhood educational development. This encompasses everything from reading aloud, reading with a friend, and reading quietly to oneself. It is a life skill that needs to be developed early on. Therefore, having a library in the classroom cannot be overrated. 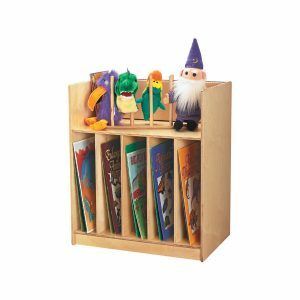 The Jonti-Craft pick a book range offer ideal classroom solutions to storing books. They are a suitable size for the classroom space and at an easy height, for little kids to reach. They offer space for books of all sizes and can be single sided or double sided. Having books displayed visually in the classroom and easy to access really promotes a healthy relationship with reading for children.